CBG’s SRS Series™ equipment is programmed for time, temperature and vacuum levels (with a vacuum assist on the SRS2). The ethanol distillation process is automatic from start to finish and can be completed in just a few hours—to less than a day—depending on the volume being processed. As a result, there’s no need to continuously and manually monitor/adjust temperature and vacuum levels, saving you time and labor. Simply turn it on and walk away. *Recovery rates/processing times may vary depending on ratio of extract to solvent. Capacity: Our SRS Series™ is available in 8G (30L) and 15G (56L) sizes. The entire capacity doesn’t need to be used to effectively process and remove solvent used when processing to recover concentrate. These systems are designed to enable bulk production and recovery in the volumes you require. This automation, coupled with the SRS Series™ logarithmic program, enables consistent solvent removal processing for a consistent quality product batch to batch. Preservation of Yield: The CBG SRS Series™ operates in a controlled and enclosed environment within the unit’s footprint. It doesn’t possess a boiling column or a condenser in sequence, so the risk of valuable essential oils going up and into the condenser is avoided, preserving valuable yield. Materials of Construction and Safety: The CBG SRS Series™ is made of high-quality 304-grade stainless steel (SRS1 and SRS2 Series are UL2208 certified; 316-grade stainless steel is available). The stainless-steel configuration is also quite durable, not subject to cracking or breaking, unlike expensive and fragile glass components. Economics: Recovered ethanol is reusable for extraction and/or purification after distillation, greatly reducing future ethanol purchases and expensive disposal costs. CBG’s Extraction/Purification/Distillation and Recovery System (EPD=R™) is designed to process and purify essential oils and help capture the desired cannabinoids from cannabis and hemp—an ever-changing and progressive industry. Learn more by viewing CBG's EPD=R Ethanol Extraction System Introductory Video. 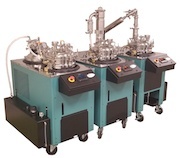 The EPD=R™ System is composed of three modules, one for extraction, purification and distillation respectively. At the forefront of helping provide clean, effective concentrate for those who need it most, our EPD=R™ System is an EtOH Extraction and Purification System that extracts and purifies biomass to yield essential oils using high-purity ethanol. The system then distills the ethanol—enabling it to be recovered for future extractions—and separates it from the essential oil and concentrate. Ethanol is a tried and true solvent that’s been used for centuries to craft tinctures, essential oils and similar substances. In modern times, alcohol is still among the most commonly deployed solvents. Ethanol is nontoxic and is both a polar and nonpolar compound, making it the ideal solvent for botanical extraction. CBG’s automated 30L extractor and purification modules provide subzero temperatures to cool plant material and chill ethanol. When ethanol’s temperature is lowered below freezing, its pickup of soluble components is substantially slowed and the ability to attach to frozen water-based components is nearly eliminated. The automated purification module has been designed to preheat and filter the solution through your choice of activated carbon or other media prior to distillation. The distillation module uses fractional distillation, which is a special type of distillation designed to separate a mixture of two or more components that have different boiling points. The process involves heating the mixture and partial condensation of the vapors along a column (fractionating column), which is configured so that components with lower boiling points pass through it and are collected earlier than the components with higher boiling points. Generally, this method is used when the component parts boil at less than 25° C from each other. Fractional distillation differs from simple distillation because the fractionating column naturally separates compounds based on boiling point. CBG’s EPD=R™ System operates in a controlled environment within the unit’s footprint. It’s built modularly, enabling you flexibility when processing. This also enables you to process multiple batches of biomass per day—thereby providing excellent concentrate quality and throughput. Quickly and easily calculate how much you’ll save by recycling solvent.